Which Gymnast Does Your State Love the Most? If you miss the Perfect 10, head for South Dakota! 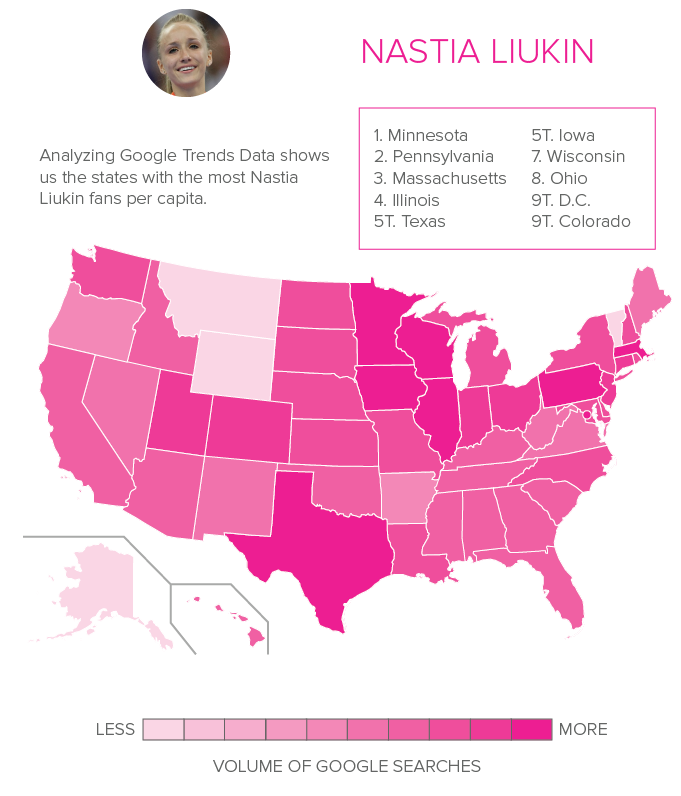 We analyzed Google trend data to discover where the most dedicated gymnastics fans live. 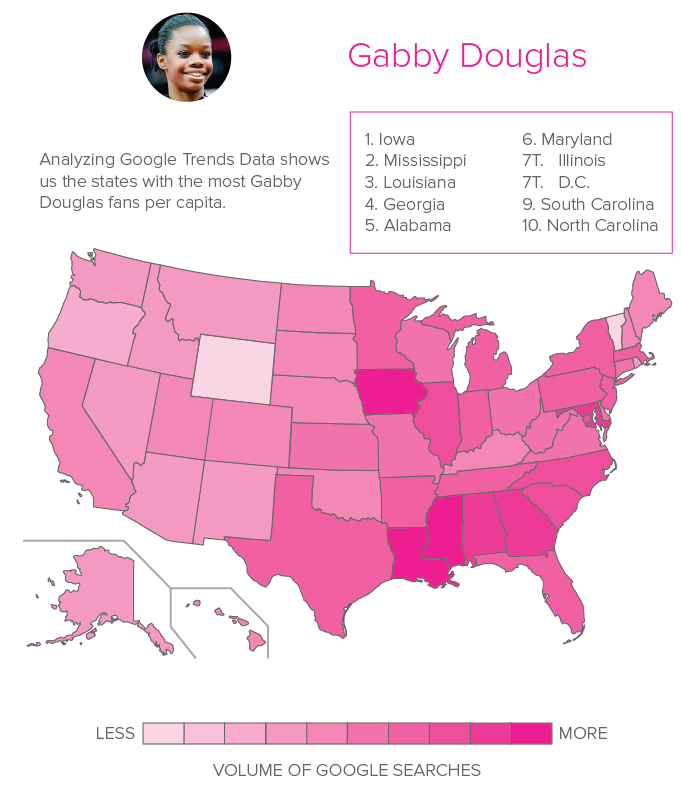 As it turns out, Kyla Ross’s biggest fans aren’t in her home state of California. They’re in her birthplace of Hawaii. 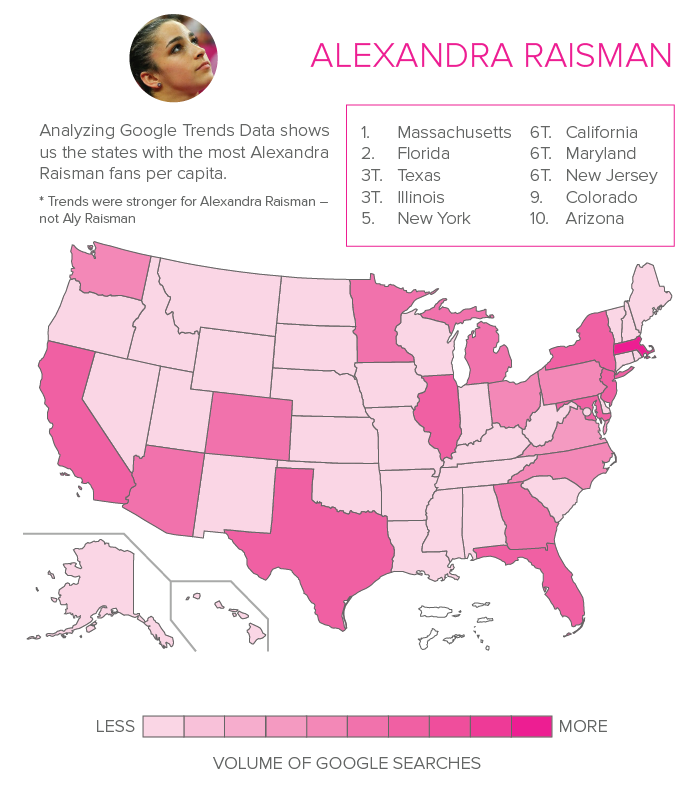 And it appears that Marta does a lot of Googling for Aliya Mustafina in Texas. Where do you find your fellow gym nerds? Just check the maps. McKayla, Gabby and Nastia are the most popular? I’m a little surprised and a little not surprised…Nastia’ hasn’t competed seriously since Beijing but has somehow been stayed relevant in media… but the other two? Well i guess they are media darlings as well, come to think of it. The fact that TMZ stalks Mac should be indication enough. I’m sad Simone, Kohei, and Aliya’s maps aren’t pinker; they’re the most accomplished of the group! Nastia’s map is influenced by being a female Olympic all-around champion, which gives her a big boost, and by being on Dancing with the Stars, a show with 17 million viewers. As for McKayla, her “unimpressed face” certainly helped her. Unfortunately, the recent phone hacking situation probably boosted the number of searches for McKayla’s name, as well. As for Gabby, there’s the whole Olympic all-around champion thing. And don’t forget about Oprah. 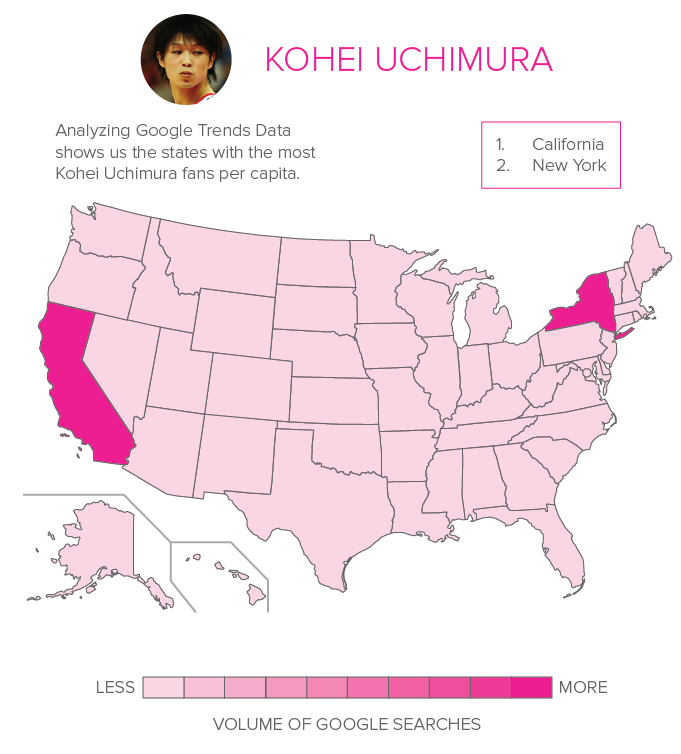 So it appears that all gymnastics fans live in the USA, what a coincidence ! It\’s always funny to see how you guys in the USA believe that the world stops at the US border. Hi Kaboom – We considered doing a world map, but Google’s data would still limit us to the English-speaking world. Google’s trend data is based on exact phrases. So, when we look up “gymnastics,” we don’t see data for the equivalents in other languages like “gimnasia” in Spanish. For the keyword “gymnastics,” the top location is actually not the United States. It’s the Isle of Man in the British Isles. Number 2 is the United States, followed by Canada, Australia, Botswana, and the United Kingdom. Thanks Gymcastic for the nice explanation about a world map. Kaboom, this is a website for thoughtful and kind gymnastics fans. This is not a place where most of us want there to be the kind of vitriol and hate-mongering found in your post. We love gymnastics. Period. Furthermore, Gymcastic is a U.S.-based podcast/website and the majority of the audience is U.S. based, so this topic is of interest to many people. Additionally, it says right in the title what geographic area is surveyed, so to expect anything else is unrealistic. If you don\’t want to read about this, then don\’t click the link. Also remember that Gymcastic does cover gymnastics all over the world, which is why there are so many international fans in addition to American fans. Please be more considerate before you write and remember that Gymcastic is a place of welcoming, not hate. i\’m surprise Kohei isn\’t more popular. just like i\’m surprise Aliya is more popular then Simone, i can\’t believe Texas, notorious anti-Russians, loves Aliya lol. We, Americans, are a shame for not knowing more about Kohei! What’s interesting about Simone’s map is that some of the states overlap with locations that she has competed. The U.S. Classic is in Chicago, Illinois. She has competed at Nationals in Pittsburgh, PA, and she has competed at the American Cup in Massachusetts. The data suggests that a lot of spectators (and journalists) are Googling her at the event. Interesting data, but is it really a reflection of who is loved most, or is it just who (or what) is googled most. There is a big difference. It is only representing the distribution of searching volume of a certain name among states, but not the absolute volume. If someone is loved in a particular state, then the distribution would go extreme.